Are you backing up? Do you have enough storage for your laptop, or your Macintosh computer? How about portable storage? Can you move your storage around if you need to? I have a solution for all of these and it it is called the NewerTech Guardian MAXimus mini (Abbriviated here as GMM) from NewerTechnology. 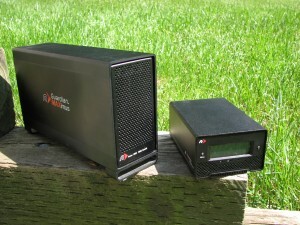 As you can see in the picture below, these drives are much smaller than the original Guardian MAXimus units because they utilize the smaller 2.5″ internal drives used by laptop computers. This makes the unit very portable, or inconspicuous on your desk. Weighing in at a mere 1.5 lbs. with a small 3.5″ x 5.2″ x 2.1″ footprint. These 2.5” drives are great because they are quiet and fast for their size and the only downside is the largest 2.5″ drives top out at 750 GBs. Otherwise these are fast 7200RPM drives that work very well. 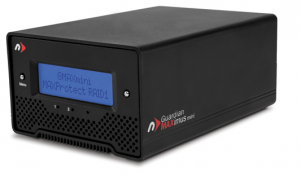 The unit itself has an LCD screen on the front that you can use to set up the GMM as a RAID 1 or a RAIN 0 (What is a RAID link) however, if you buy the enclosure with drives already inside then the unit is already set up and ready to go as a RAID 1 drive. 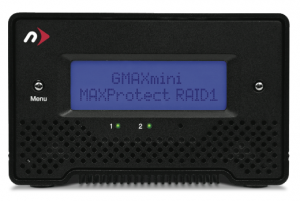 The blue LCD screen provides an easy way for you to see the drive’s vital statistics, drive size, RAID set up scheme, backlight settings, alarms, and you can even erase the unit from here. It even tells you how you are connected. The “Menu” and “Enter” buttons on the faceplate allow you to walk through the various menu options. The unit is very quiet. 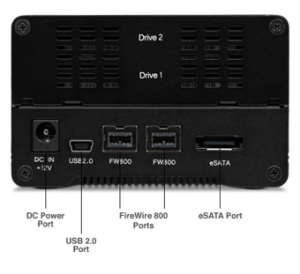 Connect the GMM using USB2, FW 400, or eSATA. Cables for all of these are supplied as well as an AC power cord. I wish the cables were longer. 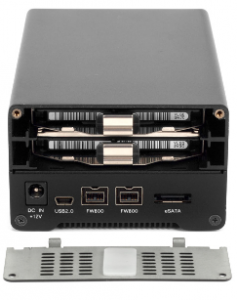 You can buy this unit as an empty enclosure and insert your own drives, or buy it loaded and preconfigured from NewerTech in a variety of sizes. One of the nice things about this unit is hard drive removal is easy via the panel in the back. Remove the two screws and a door pulls down allowing you access to the drives. From there it is simple to either replace a bad drive or upgrade to a higher capacity drive. As I said earlier, this unit is fast. I copied three video files (6.32 GBs) using the FW 800 port and it only took 1 minute 41 seconds. Copying the same files using the USB port took three minutes and fourteen seconds. Mixed media files took a bit longer. An 11.6 GB mixed media file (800 items) took a shade over 3 minutes using the FW 800 port, and almost six minutes using the USB port. The unit is self powered when connected to your computer using the FW 800 port but you will need the included power adapter when using the USB port. I would be remiss if I did not mention the NewerTech Software bundle disk that comes in the box. This disk includes useful utilities from Prosoft, Bombich, and Intech Software, plus NovaStor for Windows users. If you aren’t backing up your laptop or Mac, think about what you have on your hard drive for a moment. Family movies and pictures, important financial and medical documents, maybe business projects, and perhaps that novel you’ve been working on for the last year. Now think about how you will feel when that drive dies. The question is not “if” the hard drive dies, the question is “when.” Hard drives are mechanical devices that will eventually wear out and die. Let me tell you from personal experience, that when they die, it is usually sudden and with no warning whatsoever. Yes, I have lost that kind of data in the past and now I keep multiple backups all the time. I’ve found that having one back up is not enough. Suppose your internal hard drive dies and your back up drive dies or is corrupt all at the same time. Sure, you can go nuts with this stuff and fixate on how many hard drives do I really need to make sure my data is not lost. There are a wide variety of solutions that work for different situations, and what works for one person won’t work for another. I think, at the very minimum, having a backup using a RAID 1 set up of two drives should be sufficient for most people to safeguard their important files. Small, lightweight, fast, and quiet. What more do you need from an external RAID?